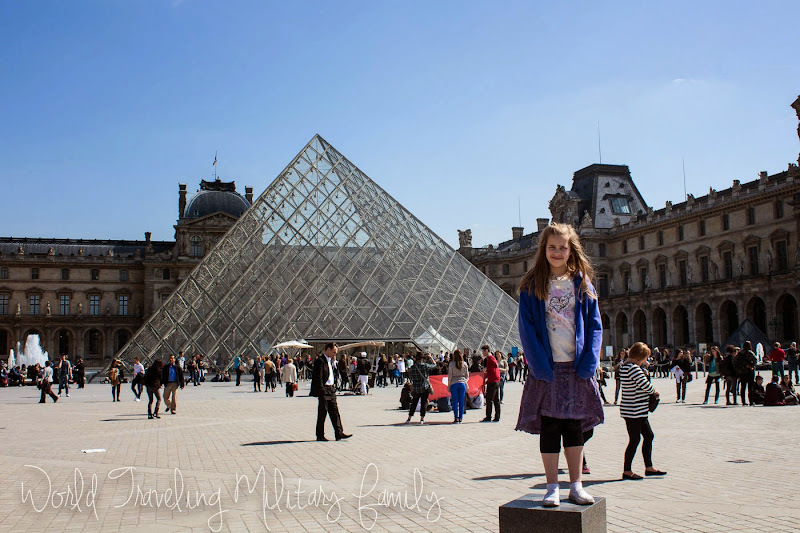 We’re not big museum people but of course since we were in Paris we HAD to visit the Louvre. Don’t get me wrong I like to go look at the stuff it’s just that museums are not at the top of our ‘sightseeing list’ and I didn’t feel the need visit several of them in one visit. I wasn’t sure what to expect but I can tell you one thing, it was NOTHING like I had imagined and not in a good way, LOL! More about that later on. 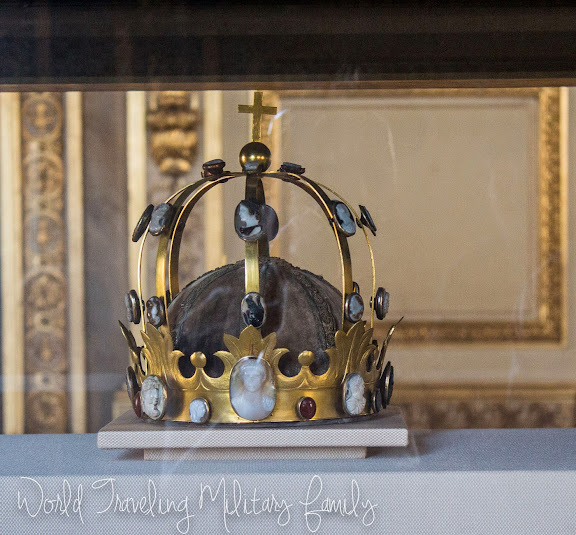 As you know from my previous post we hit the Louvre on our first day of Paris and walked there after following Rick Steve’s historic walk from Notre Dame, you can read more about that on my post here. It’s about 1.5 KM and takes about 20 minutes if your walking straight there. We stopped along the way, and it sure felt like a bit longer of a walk after climbing up & down the Notre Dame towers. We arrived at the Louvre around 2 pm on a Wednesday. 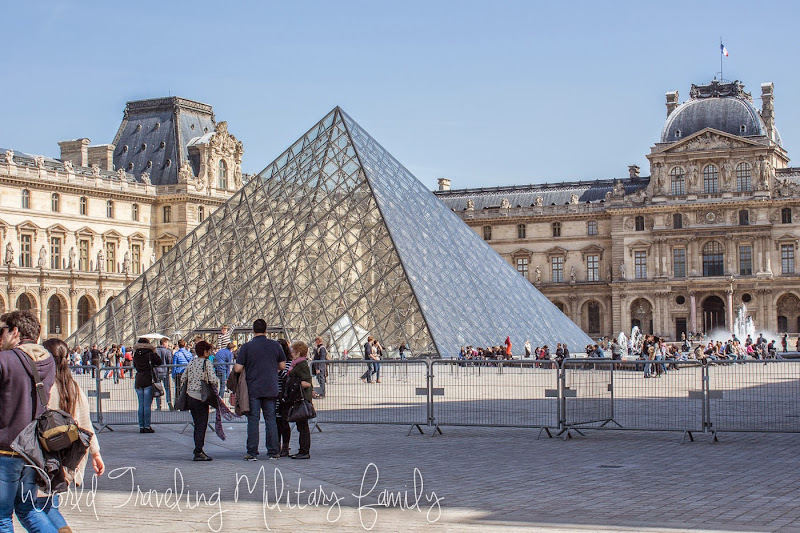 From reading Rick Steves’ we knew there was a Museum Pass entrance between the glass pyramid & Rue de Rivioli, as well as an underground mall entrance, but we were excited to find that there was no wait to enter straight through the glass pyramids. It wasn’t too crowded inside, we could walk around and see what we wanted without feeling like sardines. As you can see from the above pic, there were people around but it didn’t feel like mass chaos and I wasn’t overwhelmed. I so love the ‘selfie’ photobomb in this one! It cracks me up every time I see it 🙂 Boo was able to check this off his list of places visited before he heads back to the US for college this fall. Bub looks thrilled as usual, I’ll enjoy when he one day has to explain these to his kids…LOL! 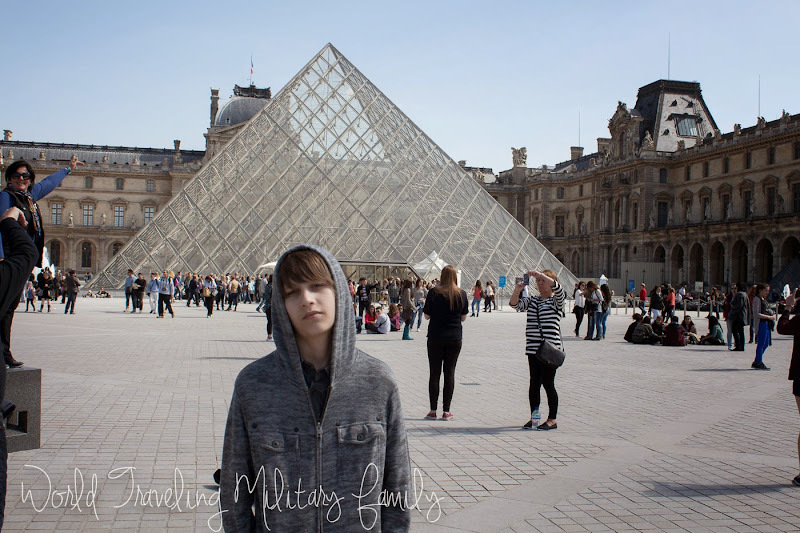 …It was SOOO stinking hot in the Louvre! It made it so hard to enjoy it all all 🙁 From all the research I’ve done no one has ever mentioned it being so HOT! It got the point where I found a vent blowing ‘air’ not even cold and we just stood over it for a bit. My friend went a week later and verified it indeed was hot, so it was not just us. I have no idea how the art can stay preserved like that? Not sure if it was because it was April & they hadn’t turned on AC yet but I would not go back and visit again in heat like that! It’s hard to enjoy looking at the stuff when you feel like your suffocating. Note your able to take pictures in the Louvre, you just cannot use your flash. So after realizing it was going to be a bit of torture we used Rick Steve’s Louvre Tour and started hitting all the attractions so we could get the heck outta there! We made it as far as Mona Lisa and then decided we’d had enough! We managed to find our way out of the maze of the museum and get our bags. I was SO thirsty that Mr. B had to go buy me a bottle of water, turned out the kids were dying of thirst too! We split the bottle of water and decided to go get something to eat. The we did not get to see The Winged Victory as it was out for restoration while we were there. 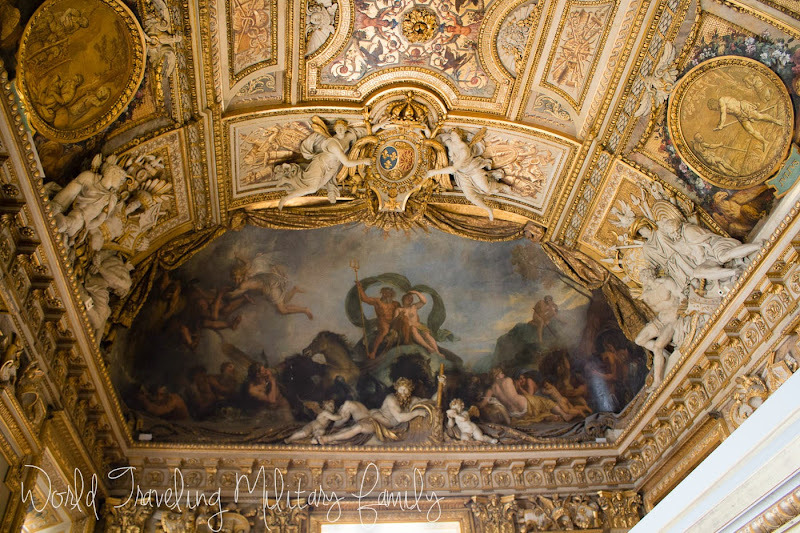 The Louvre used to be a palace so there is some amazing artwork on the ceilings as well. 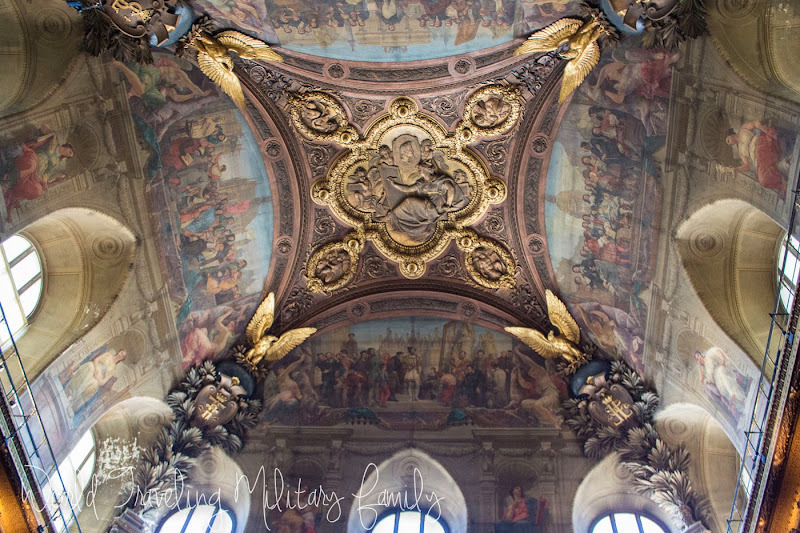 I’m always so impressed with these amazing works on the ceilings that someone painstakingly painted by hand, it had to have taken so many hours to complete! There was a crowd around the Mona Lisa, as to be expected. I knew it was small but Mr. B had just found out before we left for Paris, he was a bit disappointed to find that out, LOL. It’s small & behind plexiglass so it doesn’t make for the best photo op. Boo & I managed to wiggle our way to the front so he could take a ‘selfie’ with Mona & I could get a pic. This is a ginormous painting across from the Mona Lisa, as you can see there are quite a few people in this room, and even more were clustered around the Mona Lisa, but again it wasn’t horrible. This was the most crowded room while we were there so since we didn’t plan on hanging out in there a long time it wasn’t bad. 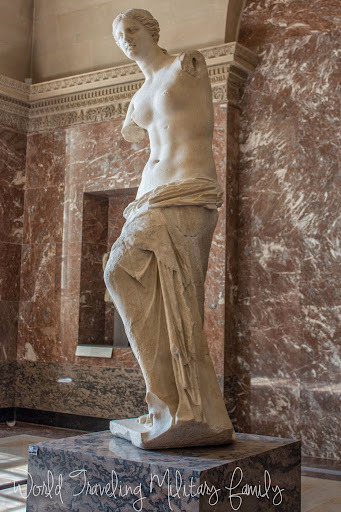 The bathrooms in the Louvre were horribly crowded & with long waits for the ladies, of course no wait for the men as usual. 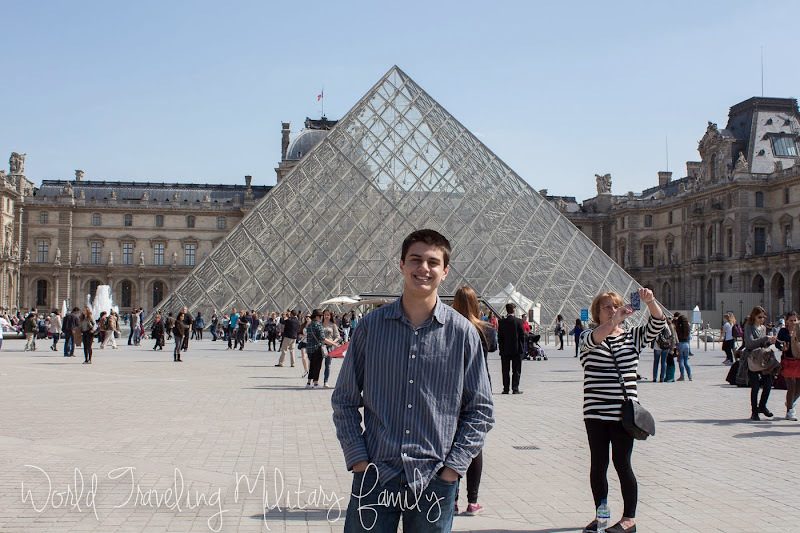 We headed over to the Carrousel du Louvre which has a food court, to include McDonalds, and Starbucks! As soon as we entered from the Louvre lobby we were greeted by cool air, it was so refreshing and MUCH more enjoyable than the Louvre. It is here that you can see the underside of the glass pyramid & take pics. My brain was so sapped from the heat stroke of the Louvre that I couldn’t even remember to think about taking a pic. Boo said he wanted to eat at a McD’s in every country and by this point we were so tired we didn’t care. We got dinner from McD’s & some Starbucks for Bub. They had a neat seating that was comfortable at the McD’s & food court. After eating we headed out to find the Big Bus pick up point. It’s actually outside the arch and across the street from the Louvre. We rode that to the Arch De Triumph to see the city & catch the RER train back to Disney train station. Was it worth going and seeing…yes and no. It was ‘free’ because it was included in our Paris Museum Pass but I can’t say I’d pay €11 to see it again. Was it enjoyable…no not really. 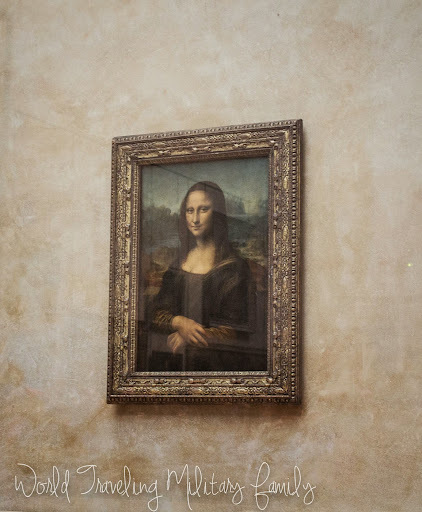 Did we get to see the infamous Mona Lisa…yes, we did. We also got to see the ‘must see’ glass pyramid & take pics..but we could’ve did that without enduring the torture of the heat inside, LOL. The best part by far was the food court! How To Get There: Approx. 4 hour drive from Spangdahlem. From Notre Dame: It was about a 20 minute walk (1.5 KM). Hop on Hop off bus & Batobus drops off near here. 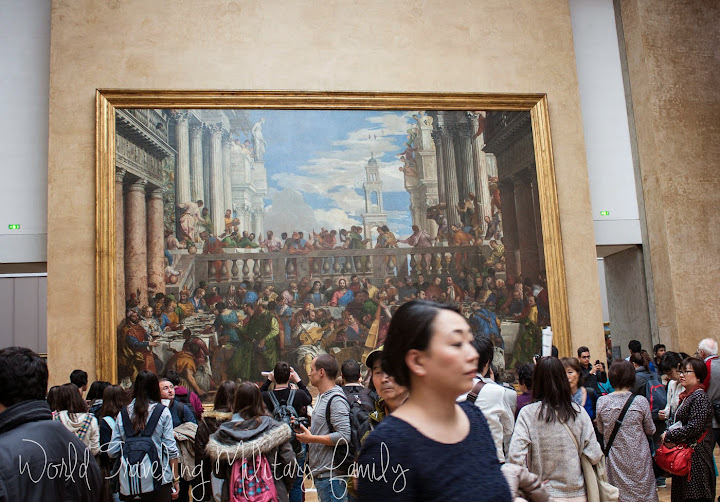 What: There is tons of stuff to see at the Louvre, how much time you spend there is up to you, it’s huge! Plan on spending at least 2 hours there and longer if you want to try and see more. Make sure you stop by and say Hi to Mona Lisa! 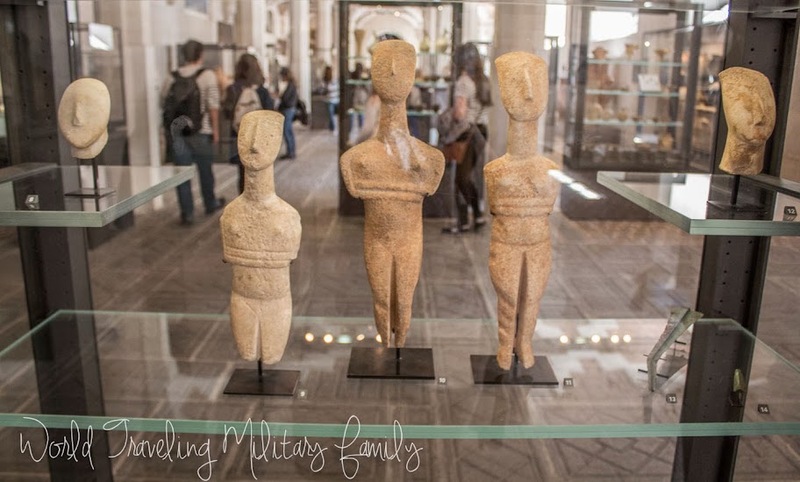 Cost: €11 or covered by the Paris Museum Pass, also note kids 18 and under are free. You just need to get them a ticket at the register but it is free. When: Note the Louvre is closed on Tuesday, as are many other attractions so keep this in mind when planning. Open Wed-Mon 9 am to 6 pm, but open until 9:45 pm on Wed & Friday. Last entry is 45 minutes prior to closing. 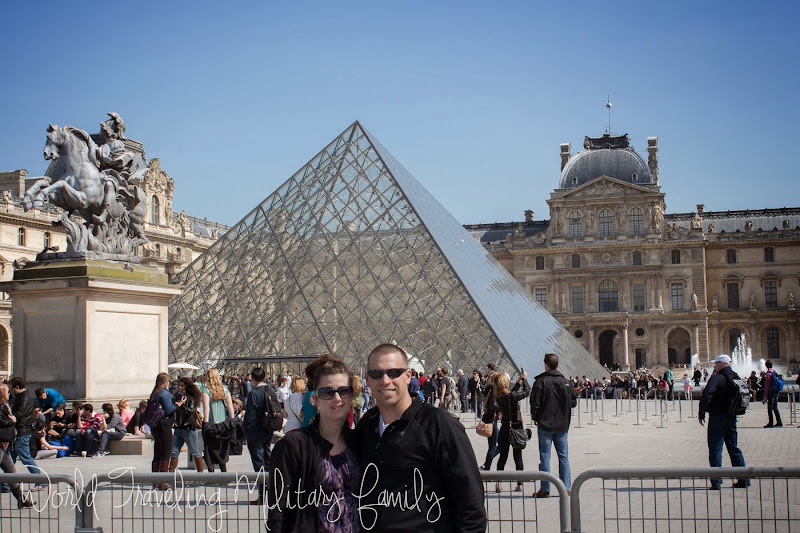 Rick Steves’ Paris – this book was AMAZING for our trip, he has a Louvre tour in the book that is great. Been to the Louvre? What did you think? We were just in Paris! 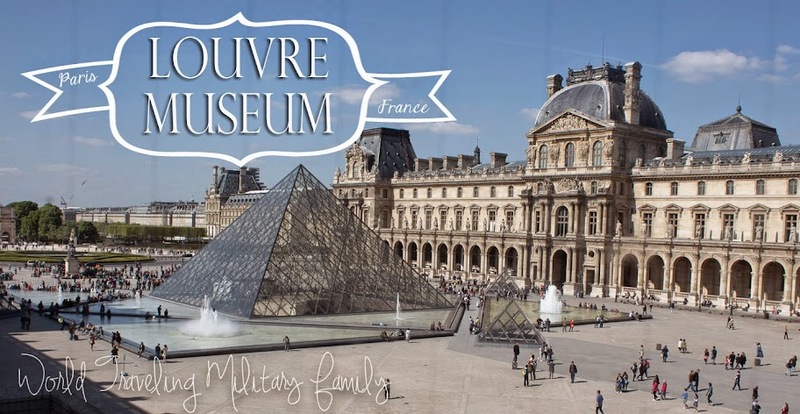 We had visited the Louvre on our honeymoon ages ago, so decided to skip it with our little kids this time (though we may have tried it if we were staying much longer). It seemed like EVERYwhere in Paris was hot. Maybe it’s all the people? Anyway, the Louvre stop on the Metro line we took was closed. We had walked there from the Opera, but It was a good reminder to check the latest info before planning your day.